Rennicks two-part moulded traffic cones are manufactured from LDPE durable plastic with a heavy-duty composite base for strength. They are fully compliant with EN: 13442 (2008). 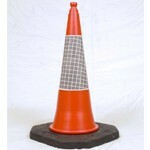 For added security we can offer cones with logos and text on the sleeve, and Company details embossed in the base. Available in 1m and 750mm versions. The base width is 430mm x 430mm. They stack with other two-part cones. 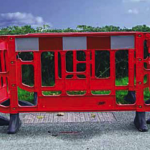 Rennicks pedestrian barrier is ideal for Traffic Management and Work Zones where a safe area needs to be provided for both workers and passing pedestrians. This stackable barrier has all the usual advantages of standard barrier systems but has many unique features in addition. Rennicks pedestrian barrier is made using a precision injection moulded construction, with central struts throughout to give additional stability. There is a linking facility allowing the system to be easily joined. Swivel feet are attached to the barrier at the point of manufacture to assure the highest level of stability in all weather conditions. 1.2m x 2m long. Red and white reflective panel for added visibility. 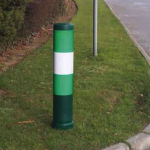 Rennicks’ Junction Definition Posts (JDP’s) provide a highly visible and safe means of alerting motorists to the presence and position of a junction. Nikkalite® Class ref 2 retro-reflective green and white sheeting is used to provide excellent visibility in all weather conditions, and especially at night. Size available – 1000mm high and 200mm in diameter. Also supplied with a pre-fitted base to allow ease of installation into a concrete foundation.